The past. Casey is a little kid, worried that his dad should give into the Purple Dragons and their protection racket, lest something bad happen. Mr. Jones becomes violent and tells Casey that he’s playing on HIS team and that a Jones never gives in (nearly punching Casey in a violent rage). Mr. Jones hears something and figures it’s the Purple Dragons breaking into his store. Casey snaps out of his flashback and decides that it’s time to make the Purple Dragons pay. He puts on his hockey mask and golf bag full of blunt instruments and goes to work. The past. Casey watches as his father’s store burns to the ground. 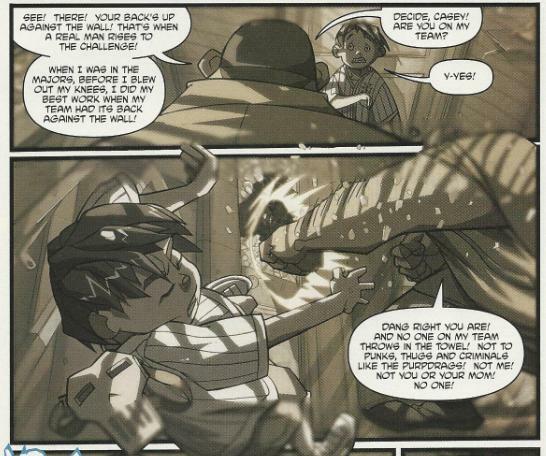 The Purple Dragon leader, Hun, then smacks Casey aside with the encouragement that his father pay up. Prowling the streets, Casey spots some punks about to mug a woman (mother of the kid next door). He beats them up, but even after they surrender, he continues to wail on them with his hockey stick. Casey is suddenly subdued by Raphael, who tells him to chill out. Casey isn’t in the business of being told what to do and bashes Raph over the head before chasing after the fleeing punks. The past. Casey breaks a bottle and stabs Hun in the leg with it. Furious, Hun has his thugs beat Casey to a pulp. Before being thrown out of the hospital because he lacked insurance, Casey is diagnosed with brain damage from the beating. Shortly after that, Mr. Jones goes searching for Hun to get revenge and vanishes. Casey’s mom then goes searching for her husband and vanishes, too. 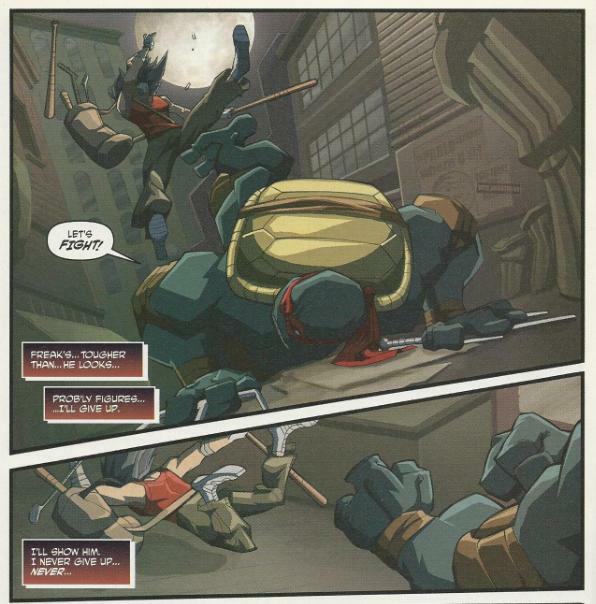 Casey continues beating on the thugs until Raph intervenes. Raph tells him that his heart is in the right place, but he’s meting out punishment with too much violence and not enough thought. Casey still isn’t listening and the two of them thrown down. Raph knocks Casey down, but Casey hits him with a surprise attack and flees on his motorcycle. Before he leaves, he tells Raph to meet him in Central Park on Friday night to finish things. Climbing the fire escape to his apartment, Casey overhears his neighbor about to get violent with his wife and son. Casey smashes through the window, prepared to beat the man down. The man stands between Casey and his family and vows to protect them from the vigilante. Casey realizes what Raph was trying to tell him and runs away. In his apartment next door, Casey overhears the family telling a cop about the masked psycho that tried to kill them and the son calls his father a hero for protecting them. Casey drifts off into a delusional state, reassuring himself that his father and mother are still alive, just waiting for Casey to clean the streets of all the Purple Dragons before they can return. *This story is continued from TMNT (Dreamwave) #3. The story continues in TMNT (Dreamwave) #5. 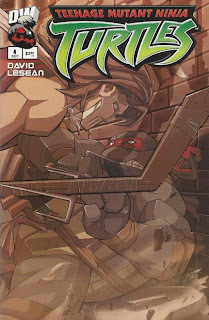 *This issue was adapted from the 4Kids TMNT animated series episode “Meet Casey Jones”. This is probably the first issue of Dreamwave’s TMNT comic to actually be readable. The story follows Casey Jones and gives us deeper glimpses of his past, while the Turtles are again reduced to cameo status, but I think the difference in this issue is that it doesn’t feel like there’s a larger story we’re missing. Yes, there is an entirely separate subplot from the 4Kids episode that got excised (Raph coping with his own anger after nearly braining Mikey), but David wisely ignores all that crap and gives us just ONE plot to follow. No confusion about stuff being referenced that we aren’t seeing; just a single coherent storyline. A Dreamwave first, ladies and gentlemen. While it’s still the familiar story from the 4Kids episode “Meet Casey Jones” (or Raphael microseries #1, if we're being honest), it’s interesting to actually SEE the relationship between Casey and his father that we’re told was so important, but the cartoon never bothered to explore. There’s a rather shocking revelation involved, as we learn that the father Casey worshiped was really a violent, stubborn, frightening man. There’s nothing pleasant about him, as he calls women stupid, puts his pride before the safety of his family and proceeds to teach Casey a lesson about courage by nearly punching a hole through his head. I think this did a decent job of illustrating Casey’s delusional state, as the person he’s describing isn’t the person he’s remembering. In fact, it was satisfactory enough that the issue REALLY didn’t need to end on Casey desperately trying to convince himself that his parents are still alive and watching him and waiting to come back, but only after he cleans up the streets. That was laying it on a bit thick (likewise with the overstatement of his brain damage; a briefer mention would have gotten the point across just as well). I did like the dichotomy of the neighbor family; a violent, irritable father neglecting/abusing his son, but the son looking up to him regardless of treatment. It’s likely a matter of coincidence, but a few elements from David’s expansion of the “Meet Casey Jones” episode seem to have seeped their way into other TMNT continuities. Mirage’s Tales of the TMNT (Vol. 2) #56 adapted the idea of Hun killing Casey’s father and burning down his store (something the 4Kids cartoon writers thought up), but the issue also incorporated the idea that Casey took on brain damage after the violent beating he took from the Purple Dragons. To my knowledge, David is the first author to ever pitch the idea that Casey is legitimately mentally handicapped. 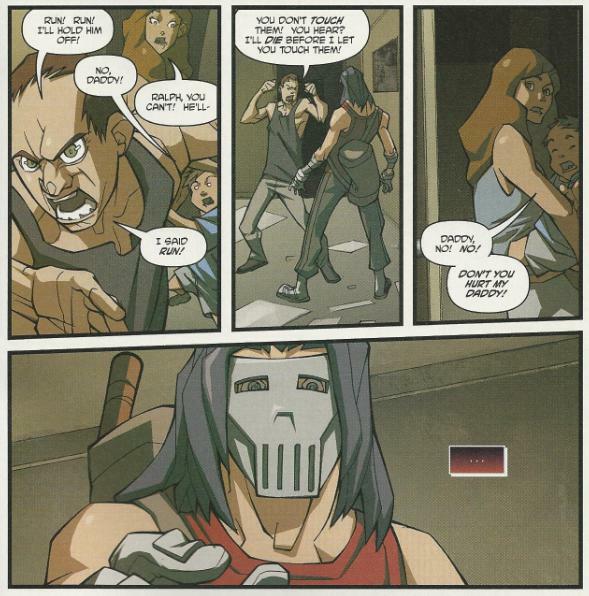 There’s also the portrayal of Casey’s father as a violent brute; something IDW adopted early on with TMNT (IDW) #1. The two Mr. Joneses don’t share any similarities beyond that, but being a child-endangering scumbag seems to be a consistent portrayal for the character. So yeah, on a script level, this was a pretty solid issue. It overstates some stuff to get the point across, but all in all, it’s actually a GOOD expansion of a 4Kids episode. So what brings it down? The lousy art, of course. I’ve gone on ad nauseum about Lesean Thomas’s numerous failings as an artist and I’m really in no mood to repeat the same old critiques. All I will say is that he isn’t getting any better; Thomas is not an artist in any hurry to improve his craft. In fact, believe it or not, he may actually be getting worse. He copy-pastes the splash on page 1 and recycles it for the last page of the issue, repeating it to fill 4 panels. Now, I understand the intent: to illustrate how the same pose can represent both grim determination and pathetic defeat, distinguished only by the context of the inner monologue bubbles. But for the love of god, REDRAW the damn panel! Even if there are just subtle differences between the two versions of the same basic layout, it still keeps the damn thing from looking like a cheap, lazy shortcut. Also, hey, scroll back on up there and take a closer look at that scan of Casey getting kicked by Raph. Notice how when he goes flying his bag is over his right shoulder, but when he lands it's over his left shoulder? Crap like that everywhere. And once again, we’ve got 5 colorists and 2 inkers just to get a single issue onto the stands. This thing is a mess of conflicting lighting, toning and photoshop effects between pages and panels. Worse yet, most of the colorists on this issue are completely new to the book, making the look even less consistent than usual. A competent publisher would assign a dedicated colorist to a title to maintain a steady look; that’s just a fundamental. But then, Dreamwave went bankrupt for a reason. What I also liked are all the 4Kids ads in the comics that flat out point out that the turtles in the comic look nothing like the how they look on the show it's supposed to be based on. I actually liked how the Turtles looked sometimes with LeSean.. the people sucked but I thought the Turtles were put in lots of dramatic poses. Am I crazy? This issue was the first one I actually bought in the Dreamwave line. Issue 5 was the only other one I bought new off the shelf back in the day. I never thought about this being one of first pieces to delve into Casey's backstory and psyche until now. I know what you mean, man. The early 00s were a strange time for comic artwork in which everybody was trying to use digital technology to do shortcuts, but I also appreciate the energy that LeSean brought to the turtles. And at the time, it was probably one of the most dynamic takes on a Turtles comic book art... especially compared to some of Lawson's work on Volume 4. But maybe I'm just a bit of a slave to nostalgia myself. I think you're too harsh on this one. The fight between casey and raph actually looked more dynamic than the animated one.